Tower Station and U-Drop-Inn Cafe in Shamrock. 66 Super Service Station in Alanreed. Bent Door Cafe, Phillips 66 gas station in Adrian. US Highway 66, popularly known as "Route 66," is a significant as the nation's first all-weather highway linking Chicago to Los Angeles. When contrasted with transcontinental corridors, Route 66 does not stand out as America's oldest or longest road. What sets this national highway apart from its contemporaries is that it was the shortest, year-round route between the Midwest and the Pacific Coast. Route 66 reduced the distance between Chicago and Los Angeles by more than 200 miles, which made Route 66 popular with motorists who drove west in subsequent decades. Route 66 Map. Use your mouse to zoom in and out on the map to see the various alignments. Seen below are some of the places of interest along the Route 66. For more places of interest, Explore Route 66. 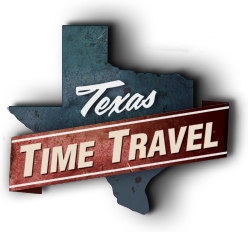 The Texas section of Route 66 contains some 960 road-related historic resources including auto repair garages, gas stations, diners, tourist camps, auto courts, motels, road markers, paving, traffic signs, and bridges. We gathered together the best of the resources (National Register Listed, Recommended Eligible for the National Register, and Recommended Contributing to a District) into an interactive map so you can experience the riches of Route 66 from your desktop, laptop, or smart phone. If you are interested in applying for National Register designation and/or Preservation Tax Credit Incentives for any of these resources, please contact the THC's National Register Coordinator to discuss the project. Click on the red Explore Route 66 button above to start your adventure. If you are interested in seeing all of the surveyed resources, click on the Other Ways to Explore Route 66 in the right sidebar. Route 66 runs through the Texas Plains Trail Region. Skip the monotonous interstate to experience a bygone era full of downtowns, diners, and diversions along this iconic highway. Route 66 is featured as part of the Historic Trails and Highways travel theme.